Born into a family of artists, Greg Capra is an accomplished guitarist, vocalist, bassist, composer, and instructor. Influenced at an early age by various bands in the styles of grunge, hard rock and heavy metal, Greg knew early on that live performance and music instruction would be his life’s passion. Upon achieving an Associate’s degree in Performing Arts from Westchester Community College, Greg furthered his musical endeavors eventually earning a Bachelor’s degree in Music Industry with a minor in Audio Arts Production from SUNY Oneonta. Greg has also served as an intern for Guitar World Magazine, Roadrunner Records & SiriusXM Radio. Having studied with accomplished guitarists, Dennis Rivellino, Jeff Brown & Terry Syrek, Greg has a strong background as a guitar & bass instructor for over five years. Establishing his band Striven in 2011, Greg had the vision of fusing the grunge/hard rock sound with melodic heavy metal. Striven continually performs at various venues across the U.S and has provided tour support for national acts to the likes of Sponge, Puddle of Mudd, Fates Warning, Ripper Owens, and Act of Defiance. As an honor‘s graduate of The New School of Radio & Television in Albany, NY, Greg achieved dual- major certificates in Digital Recording Arts & TV/Video Production in 2011. 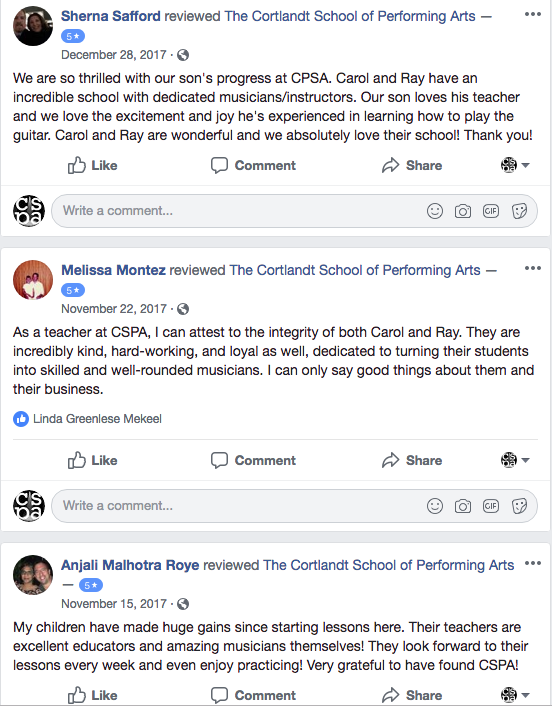 Upper Westchester's largest music school, CSPA, is dedicated to providing a dynamic environment to engage the youth and adults of the Hudson Valley in developing their musical talents. Our goal is to cultivate a love and knowledge of the performing arts at both the pre-professional and recreational levels.